The One and Only Ivan... Mighty Silverback. 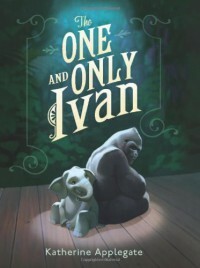 Meet Ivan, a silverback, who lives in a mall with his friends: Stella, an old elephant, and Bob, a homeless dog. Ivan has his own domain (= territory), a television, a teddy bear (aka Not-Tag) and he gets all the food he wants. Ivan thinks he is happy. Until he meets Ruby, a baby elephant. He makes a promise to Stella that he would take care of Ruby, and gets her the hell out of there. This book was beautiful, sad, funny and full of life lessons. I absolutely recommend it to everybody. It's a small book and it's really fast-paced (it took me less than 2 hours in total). I really don't have words to express all the things I felt while reading this book. I could write a really long reveiw about animals and how they are treated in the society, but it's really not necessary. This book is there to help you open your eyes, about animals, but about humans as well. It was such an amazing read. You really should read it!